happened to be published right when superheroes were coming back into vogue. Eight months later, its lead character was brought back, wearing a skin-tight outfit and using the ability to shrink to ant size as a weapon in his personal crusade against evil..
Henry Pym, the scientist who created and used the size-changing technology, added one more item to his arsenal — a "cybernetic helmet" with which to communicate with ants. (If he'd had that in his first story, his adventure in the anthill would have been altogether less exciting.) 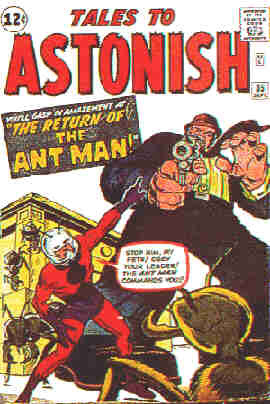 As Ant Man, he fought such villains as Egghead (no relation), The Scarlet Beetle, and The Man with the Voice of Doom singlehanded until, in Tales to Astonish #44 (June, 1963), he was joined by a female superhero called The Wasp (no relation) (him either). Later that year, the pair met Thor, Iron Man and The Hulk, and formed The Avengers. Like many of his contemporaries, Ant Man was initially written by Stan Lee and drawn by Jack Kirby. But Lee's stint on the character didn't last — it was one of the first Lee handed off when Marvel started hiring new writers, in the mid-1960s — and Kirby moved on almost immediately, leaving the series in the hands of journeyman illustrator Don Heck. In fact, Pym's entire career as Ant Man was brief (possibly because DC's Atom was already established as a super-small superhero when he came along). In issue #49, Pym started changing size in reverse, to become Giant Man. A couple of years later, he lost his Tales to Astonish spot to The Sub-Mariner. Since then, he's used two more superhero names — Goliath and Yellowjacket (no relation) — but only as a supporting character in The Avengers and other group books; he never again anchored a series of his own and probably never will. He married The Wasp in 1969, but they're now divorced. In 1979, Scott Lang, an employee of Pym's, borrowed the Ant Man costume technology for a personal emergency, and used it to become the new Ant Man. Later, Pym gave it to him, making him the legitimate owner so as to erase any stigma related to having stolen it. His series, however, lasted an even shorter time than that of the original. Today, he is occasionally seen in supporting roles — he even became a member of The Fantastic Four briefly, when Mr. Fantastic was missing and presumed dead — but is no more a major Marvel character than Pym. Neither Ant Man ever made a splash outside of comics. Both would probably be forgotten by now, if not for Pym's role in founding The Avengers — and for his association with The Wasp, who has proven an altogether stronger character. Text ©2000-10 Donald D. Markstein. Art © Marvel Comics.